Producing a quality video and having it seen by the right people used to be a privilege reserved for the elite, or people who had the resources. Not anymore. Both, video production and distribution has changed drastically, making it cheaper by the day. Thanks to smartphones, today we live in a world where a large number of people are equipped with a camera. Plus, it’s easier than ever to share and distribute videos with the help of Facebook or Instagram marketing. Which is why more and more people are doing it. So when everybody is doing it, why should real estate professionals stay behind? Video marketing is one of the best ways to get higher quality real estate leads and generate more business. Mainly because potential buyers are easier to convince and convert on a visual level. When they actually see the property or gain any related information via visual content, they have fewer doubts and questions. Real estate video marketing can actually help you gain more momentum in the long run. Research shows that listings that leverage video marketing methods get 400% more inquiries when compared to the ones that don’t. With video marketing, you’re not only generating leads, but quality leads that have a higher chance of converting. And with a consistent supply of targeted leads, your business will always have clients. Let’s look into 8 effective real estate video marketing tips that will help you get real-world results. When it comes to finding success with real estate video marketing, you need to make sure you’re starting on the right frame. In other words, you cannot be hasty in your approach or else the end result will be half-baked. A lot of real estate professionals think that creating a video is enough, even if it doesn’t have the right level of quality. Which is simply not appropriate. What type of videos will be you focusing on? 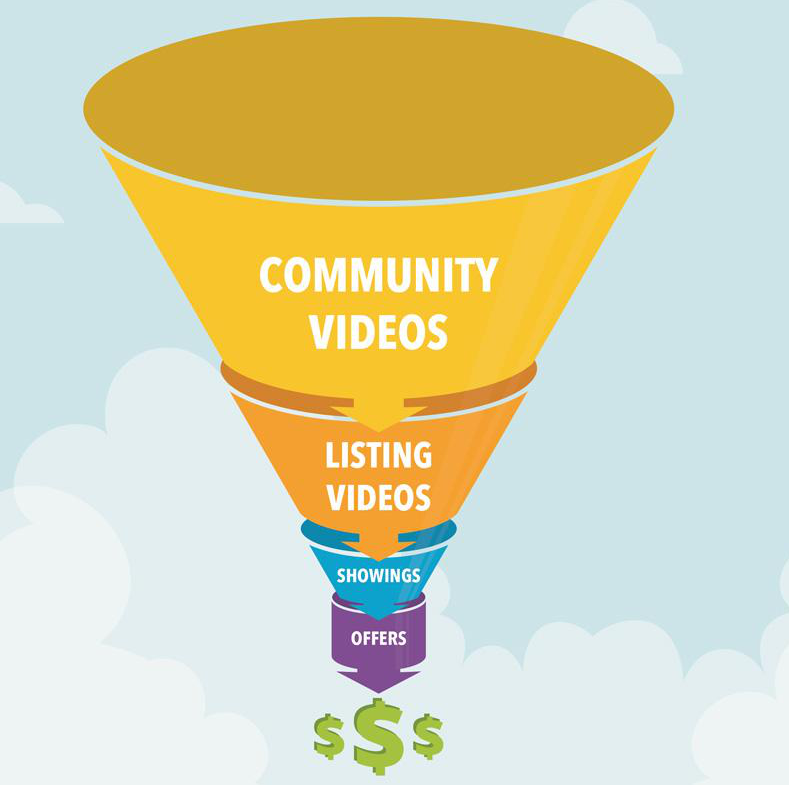 How will the video content help you close more leads? How will you be filming each video? What kind of editing will go into each video? Where and how will you be promoting them? Identify the videos that you will create at each level of your campaign. Prioritize which video you will be producing first and which can wait. Understand what level of clarity your prospects need and how you can provide it. Know what questions your video will exactly be answering. Have a clear idea on what marketing channels you will be using. The last thing you want to do is get overwhelmed. With proper planning, you’ll not only gain more clarity, but also be able to get the most out of your real estate video marketing budget in the long run. So go ahead and spend some time researching your audience, and work with your team members to ensure you reach your marketing objectives. But avoid wasting your time in too much planning. You also need to put the plan into action. People invest in a property for many reasons, there’s always some emotional quotient involved. Which is why it makes sense to use your real estate video marketing efforts as a means to tell an engaging story. Get into the home buyer’s shoes and understand where they are coming from. Identify their core feelings so that you can evoke the right emotions in their minds. Tell a story that gives them a strong reason to invest in your property. Creating a simple yet meaningful video to achieve your real estate marketing goals isn’t rocket science. That is if you involve storytelling. Use your video to help your prospects place themselves on the property by letting them imagine what they would feel like living there. If you want to show how peaceful the location is, then have them take a look around the serene environment. Whether it’s a lake by the house or a lot of lush greenery, show it off. Make the video look as less commercial as possible because you want your prospects to connect on a more personal level. Let people know exactly how and where they can get in touch with you, and add a sense of urgency to your call to action. Along with doing real estate SEO, try to promote the video using Facebook ads. It will allow you to maximize your reach and get more inquiries. The stories you tell with your videos can and do make a big difference to your overall marketing. So ensure that you are spending a considerable time on creating the right stories. When you’re using real estate video marketing, you should understand the power video content has over static images. With videos you are able to convey a vision that you cannot with photos. This is something you can use to your advantage to build a stronger, much deeper connection with your prospects. You need to basically use video to show them that they aren’t just buying some property, but investing in their dream. Tell them that what you are selling them is a complete home, not some house on the block. Because let’s face it, your prospect doesn’t really care about the details like how sophisticated the house is. They care about how they and their family will benefit from it. Show them what they would feel once they have bought the house so that they can envision how they will spend time in it. Every single scene of your video can help you towards building a deeper connection with your prospect. Which increases the chances of them investing in your property. Even if they don’t invest in it themselves, maybe they would recommend it to someone they know. Either way, you win. Here are a few things you can do to ensure your videos are helping you convey the right vision. Talk about the benefits more rather than the features of your property. For example, having a lakeside view is great, but how does it add value to the home? Use the right choice of words so that it’s easier for your prospect to see what you want them to see. Get into your ideal client’s shoes and try to understand where they are coming from and then create your video with a lot of transparency. Keep your video to the point and avoid beating around the bush or else the viewer may lose interest in what you are showing. When someone buys a home, it is an experience that take very personally. It’s different than buying something off the store. Here, you have to respect your prospects preferences throughout your video. By being human instead of appearing as a business that only cares about profits. The last thing you want is your prospects to feel like you are “selling” them. Adding the real “you” to the video will make a huge difference. The whole property buying process is obviously financially significant for your prospective client. So they will weigh in all options before taking any buying decision. Even the smallest thing can tick them off and make them decide otherwise. If your video is not minimizing the risk factor in buying your property, then it’s only going to increase it. Since emotions are involved, you need to do and say the right things throughout your videos. Your prospect will think and act more on an emotional level than a logical one. And it’s always difficult to connect to a company or a business emotionally. If you look at some of the most successful real estate videos, you’ll find one thing common: they give you the feels. And that’s what makes them so powerful. They make you want to connect with the real estate firm in the question to buy your desired home. So yes, strong emotions matter and they can take your real estate video marketing strategy to the next level. The more you add to them your videos (in a balanced way of course), the better results you will see. The bottom line is, people will always relate to other people. They will connect to the person behind the property. They want to see who they will be dealing with or trusting with their hard earned money. Being human ties in well with storytelling, which we have already discussed above. There’s no doubt about the fact that realtors are crunched for time, and they’d gladly take more than 24 hours in each day if they could. Mainly because it takes time to show properties around one by one, which can eat into business productivity. Also, when you’re trying to sell a house online (which is intangible in nature), you wouldn’t be able to show how good it is in its truest form because it’s physical. You need something in 3D; not in a boring, flat two-dimensional format. Regular videos do solve the problem to an extent but they are still limited. They don’t give much control to the viewer. The solution is to create 360 videos that make it easy for your prospective clients to look around and make a better decision. The video experience is of course different than a standard video. They have higher control and can get a virtual tour around the property. With this truly immersive experience, you’ll remove many doubts from your prospects minds, which they would have had otherwise. Given below are two real benefits of adding 360 videos to your real estate video marketing mix. Regular property pictures only show what they can show. But they lack the space/depth that you would find in a video. Plus, there isn’t much clarity on how the house is actually designed. Something that you can easily grasp after walking through the property. This problem gets easily handled with a properly done 360 video. It even lets your prospect look at all places that matter to you. Do make sure your property is in top form when you’re making your 360 video because you don’t want your prospects to get the wrong impression. When you’re trying to flip a house, you want to obviously display it in a top notch condition. But no matter how much you try, it won’t be the same at all times. And then you never know when the prospective client calls for a quick tour. If your house hasn’t been cleaned up or readied for them, it can create a bad impression and affect your conversion rate. Using 360 video, takes off this pressure to an extent, because it is created only when the house is is in its best condition. And after watching your 360 video (and getting impressed by it), if someone wants to walk-in for an in-person tour, you’ll have enough time to make it presentable. Every Internet user has come across a testimonial at one time or another. If you have a business website, you may already have some written testimonials from your clients, which is great. However, there’s something about video based testimonials that makes them stand out. They simply make a stronger impact. Let’s face it, prospects almost always have doubts, especially with real estate deals where big money is at stake. And your job is to remove these doubts with a reliable endorsement in the form of a video. Video testimonials add the much-needed social proof to your website. Prospects can clearly see that working with your real estate firm has already worked for others, so it can possibly give them similar results. You, on the other hand, will appear more authentic and your prospects will be able to trust you more easily. You could call a video testimonial a sort of a smaller, compact case study that your prospect can go through to answer his/her questions. Video testimonials make your real estate video marketing more effective because they help build trust just the way blogging does. And within the real estate industry, trust is challenging to create. A prospective client may have the money to buy the property, but they will still be hesitant because it is a big commitment. Plus, it’s also a massive lifestyle choice that will have a significant impact on their day to day life. So they would obviously want to deal with a real estate firm that they can trust. No matter how much you praise your own property and talk about its benefits, the effect will still be lower than that of a video based testimonial where your client is talking. Your leads will trust you like never before when they can imagine themselves in the place of your “happy client”. It takes a burden off their shoulders. Which means you cannot and should not try to fake testimonials or put up some bad ones. Take them seriously because they can help you get better, more significant returns. Reach out to previous, happy clients who have enjoyed working with you. Use the video testimonial in its raw, unedited format to make it look authentic. Place the best testimonial on the most viewed place on your website, such as the homepage. Even if you get a handful of such endorsements, you will see a clear difference in how your prospects respond to your marketing efforts. Last but not the least, video testimonials only work when they come from pleased clients. So if you want to have a constant flow of such video testimonials coming your way, you should treat all your clients in the best possible way as soon as the deal is signed. Do things for your clients. For example, wish them on their birthday or anniversary or surprise them with a gift card from a good restaurant. This way, you’ll be sure that they’ll return the favor when you ask for a video. Real estate video marketing works great with shorter videos because they are more impactful and don’t waste time. Keep in mind that the longer your video is, the higher the chance of the viewer leaving. People have an attention span that’s shorter than that of a goldfish. Which is why it has been found that only 37% of people who view a video online watch till the final second. Your viewer is a prospective client, and they clearly have interest in property buying. Don’t let them lose this interest. Make it as engaging as possible to see best results. If you’re not catching the attention of your viewers in the first few seconds, how will you make them watch the whole video? When they hit play, start off with the best part about the property you are selling. Don’t keep it for the last. Research shows that 65% of viewers who go through the first three seconds of a video will move till the 10 second mark or more. So make the opening as captivating as possible. In the world of social media where people are constantly bombarded with videos, you should make yours shorter to make your real estate social media strategy stronger. How short? It has been found that videos that are less than a minute tend to retain a whopping 80% of viewers till at least the half of the video and 60% till the end of it. Efficient real estate video marketing is all about quality. Because this is one industry that doesn’t play cheap. You cannot cut down on quality and expect to see results. It doesn’t work that way. If your business has the means, then you should do what it takes to produce higher quality videos. Whether it is buying a high-end camera or the right kind of lighting to make your videos look more professional, you should seriously consider making an investment. Having a perception or notion that your service is not really worthy. Thinking you are just trying to push down a low quality ad onto them. You want real estate video marketing to help your business, not tarnish your image. Now, before you start calculating the “investments” you may have to make, keep in mind that you don’t have to invest thousands of dollars. For instance, professional lighting props may cost you as less as $50 bucks, which is cheap and effective. The value of these investments is in the quality that they will help you achieve. Which goes a long way in helping your prospects believe you. Here’s example of what all you may want to invest in… Last but not the least, do your homework before buying anything for your real estate video marketing tasks. Don’t invest too much where it is not needed. Obviously it’s no secret that video marketing for real estate is an absolute must if you want more clients this year than last year. Maybe you already have the videos but need help reaching more people online. We can definitely help you with that! From social media to blogging to ads, we’ve got the skills to grow your clientele base like never before with real estate video marketing. Give us a call or complete this form and let’s discuss how to get your marketing plan started.